Players at Mr Green casino should check out the Mega Wonder jackpot, it hasn’t been won in a while and is now worth €806,564. The Mega Wonder jackpot at Mr Green casino has not been won in a while and it has now grown to just over €806,000. 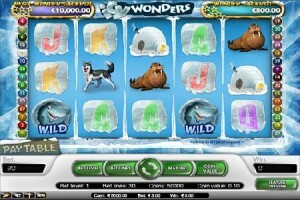 The Mega Wonder jackpot is a progressive jackpot that is not linked to one specific game. Rather, it can be won by playing one of three progressive slot games, Icy Wonders, Geisha Wonders and Tiki Wonders. Unlike other progressive jackpots that are shared between multiple games, the jackpot doesn’t have its own separate bonus game. Players need to spin five of the jackpot star symbols to win the jackpot. Spinning four of the jackpot star symbols will win the smaller Wonder jackpot which is currently worth just over €2,500 at Mr Green. Each online casino with Net Entertainment slot has its own Mega Wonder jackpot. While there haven’t been any recent winners at Mr Green, the jackpot has paid out multiple times at other casinos in recent months. Most recently a player at Unibet Casino won €256,462. To date the largest payout from the Mega Wonder jackpot was €693,266. The jackpot at Mr Green is already considerably bigger which suggests it is likely to be hit in the near future. With a background in game development spanning 8 years, Sam Peterson is OCA’s leading authority in the world of online gaming. His focuses include new releases and gaming providers.